Panzer Battle wargames fit in scale between Squad Battles and Panzer Campaigns, having 250 meter hexes and platoon units. 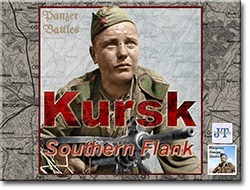 Panzer Battle wargames are designed to focus on tank battle and ranged fire. The desert though was to be the ultimate victor. The logistical requirements to support an army in extended operations was to prove beyond the ability of either side and the 1941 engagements were to be marked by theatre wide advances and retreats multiple times. The Battle of Normandy evokes so many emotions. It was the beginning of the 'Great Crusade' in Northern Europe by the Western Allies, yet was viewed as long overdue by the bloodied Soviets. Few realize that the casualties suffered in the three months of the summer of 1944 in Normandy rivaled the worst of the Eastern Front. The air and seaborne landings in Northern France were the largest the world has ever seen, with meticulous planning for D-Day, yet marked by a surfeit of clear goals once ashore. Both the bocage terrain and the dogged defense by the Germans resulted in the need for unexpected improvisation. 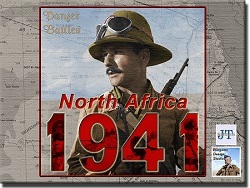 Both sides had significant constraints; the British were nearing manpower exhaustion and would have to rely excessively on their armor arm, the United States had boundless resources but many of their divisions had never been in combat, while the Germans were short of everything and it was only through their ability to organize disparate troops into flexible kampfgruppen that they held the Allies for as long as they did. Ultimately, the Battle of Normandy resulted in the utter defeat of the Germans at Falaise with France and Belgium quickly liberated thereafter. The Allied advance would last till late September 1944, ending in the streets of Arnhem with Operation Market Garden. 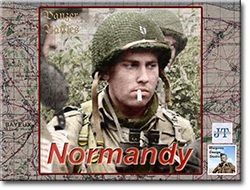 This second release in the Panzer Battles franchise is focused on many of the battles that occurred across the Calvados & Cotentin regions of Northern France. Fought across nearly three months from June 6th 1944 to August 20th 1944, actions from the D-Day landings, through the bocage fighting to the pursuit and destruction of the German forces at Falaise are included.